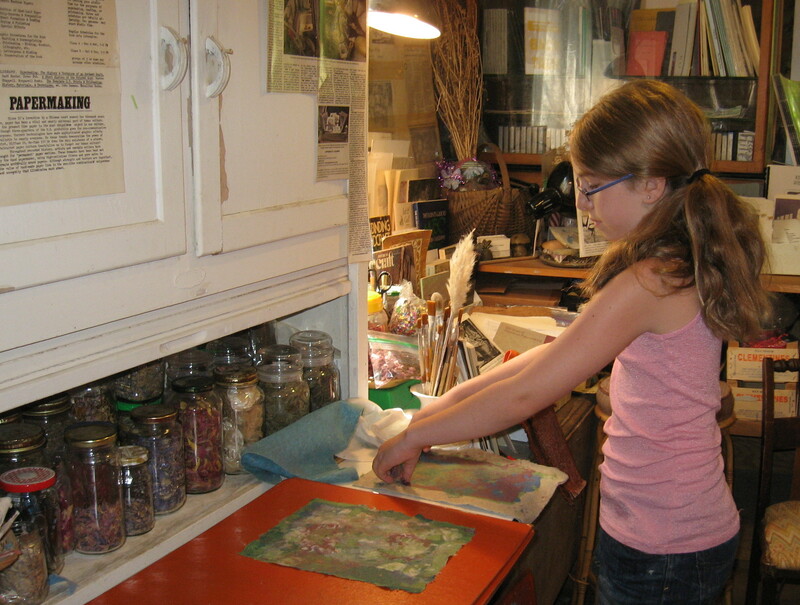 Learn how to make paper at home in one session! Following a brief history of hand-laid papermaking and its techniques, you will make a dozen sheets or more. Session tailored to your interests. Kids 6 and up welcome! The Paper Plant makes utilitarian printmaking paper for small press publishing. The paper is half cotton, half high-quality scrap. Natural fibers such as yucca, flax and okra are pounded and used as strengthening additives. We ferment and grind recycled fabrics and also use decorative inclusions such as dried flower petals, threads and confetti. One-time intro, future production sessions same price. After exploring papermaking around the world and seeing how our studio works, you will have at least 6 different pulps available for plain sheets or pulp painting. Production sessions may require trade or fee for supplies. 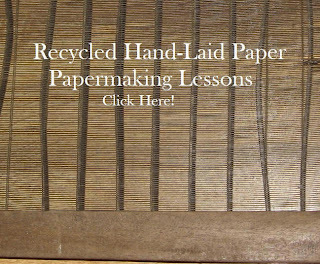 John Dancy-Jones, instructor, has been making paper since 1977. He publishes chapbooks, broadsides, and bookmark quotes as The Paper Plant, which operated as a bookstore, gallery and book arts center in downtown Raleigh, NC from 1982-1990. The Paper Plant won the Southern Book Awards prize for alternative publishing in 1987. John has taught workshops in schools and colleges, and at every age level, often assisting working artists in their exploration of papermaking. Book arts studios are open! The new studios of the Paper Plant have opened for business just outside of Asheville, NC. John Dancy-Jones is producing paper and printing, as well as scheduling papermaking workshops. 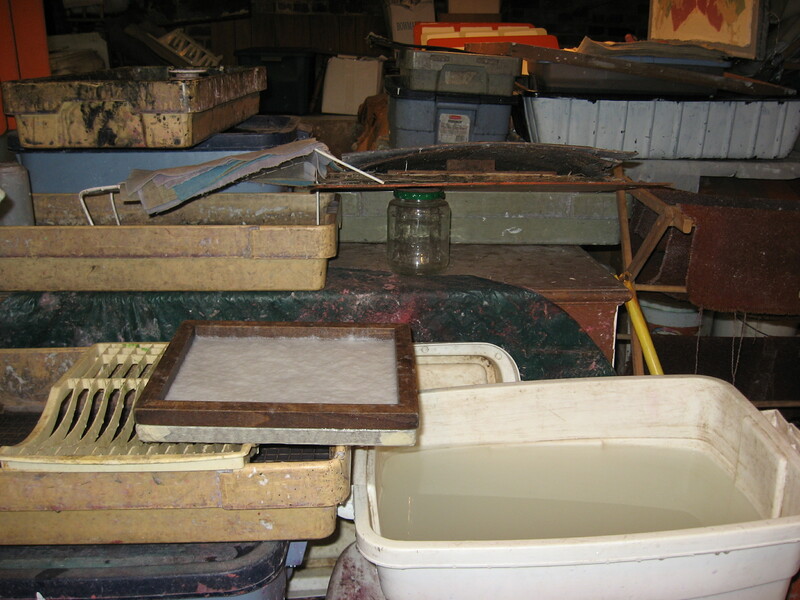 Main work area of papermaking workshop. I am just doing a trial run of my book arts camp in July, I hope to offer it officially summer 2017. Regular workshops are ready to go now, and I have several already on the calendar. educational materials for teaching book arts. The handbill is pictured below. Come see us! We offer a 3 hour workshop at our studio in Asheville, NC in which you will get basic history and techniques, making about a dozen sheets of paper. Cost is $30, $25 @ for groups of 3 or 4. John and Cara Dancy-Jones offer a one week 9-3 camp in our residential studios, garden and home. Ages are 8-12. Book arts, herbs and cooking, turtles, chickens – something for everyone. A level of interest in arts and culture is required – that said, we are both special educators and can work with a wide range of students. Call or contact per above. 2012 dates TBA.